The Racquetball Chronicles: What IS It About SNOOPY’s Laugh? My BFF Marovich and I resumed our racquetball war this morning, after taking several months off. I knew I was at risk of injury when Marovich’s tight headband flew off and landed in the server’s box, in her mad exuberance to whale on the ball. I lost the first game 21 to 3. Since we hadn’t seen each other in a while, we took a break outside of the court to catch up on news. And that was when she shared this ridiculous tale. Fair warning: This probably won’t be nearly as funny to those of you reading this, but I literally cried my makeup off laughing. This story demonstrates our shared, stupid, juvenile humor. You know, the humor that probably only we think is funny. 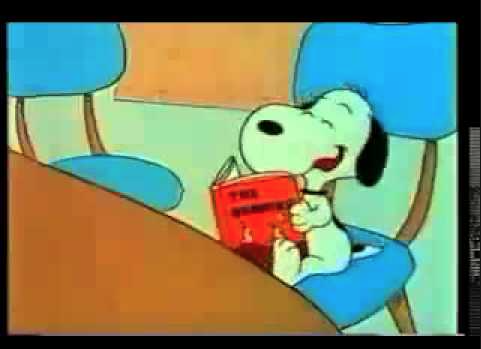 SNOOPY laughing himself right out of the library. Marovich and my friend Chrissy were shopping at TARGET and they came across this SNOOPY toy with the laughter sound chip. At that very moment, Chrissy made it her mission to nail the pitch-perfect impression of the SNOOPY laugh. She worked hard on it for many days to get it down, exactly right. So while we were sitting outside of the racquetball court, I pulled up the YouTube video of SNOOPY laughing, and that’s when we started laughing so hysterically, I cried my makeup off. I had visions of Chrissy doing this stupid laugh at Thanksgiving and everyone sitting around the table deadpan, nonplussed. One of the guys who was taking over our court after us walked in on me howling with laughter, and without even knowing what the hell was up, he started laughing. We went back into the court to play out our remaining 10 minutes. Every time I was about to serve, Marovich would throw her head back in that SNOOPY pose and do the SNOOPY laugh, and I’d lose the strength of my serve. She was Delilah to my Samson. By some miracle, I was still winning 7 – 3 when the clock ran out. I can hear her SNOOPY laugh all of the way from here. Text exchange between Jack & me Sunday a.m. My comments are in blue bubbles. 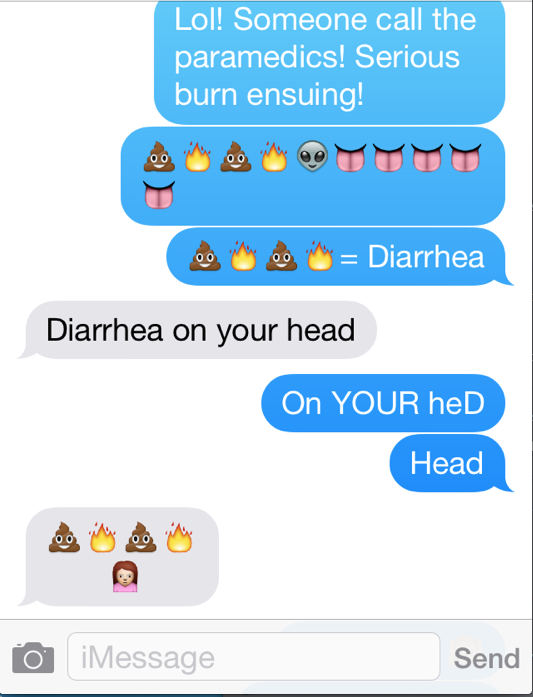 I’m just grateful he spells “diarrhea” correctly, even in text speak…I must be doing SOMETHING right. What a week it’s been! Between double-checking our Kraft Macaroni & Cheese boxes for metal shavings, Jack’s parent-teacher conference (Every.Single.Teacher.Complained…about Jack’s class clownery–yes, my DNA runs strong in the young Padawan), and getting the news that the friend we call “Texas” is moving to Colorado, it’s a good thing my addictions veer towards sugar-free Bubble Yum and reading. It would have been a rough week to come out of rehab. 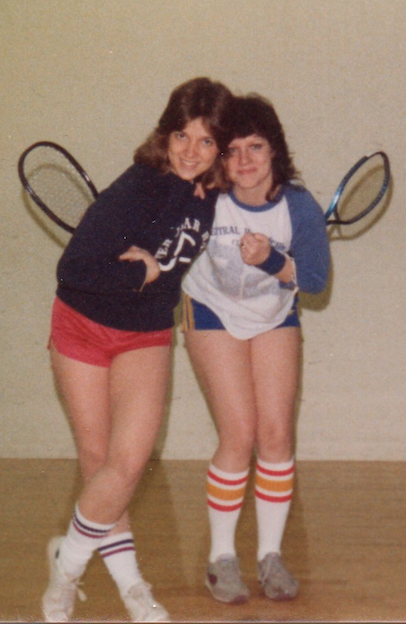 After racquetball with BFF Marovich on Sunday–me still with no wins to report, although we played the same 16 to 6 point for six rounds and invented a new rule about laughter hindrance–Marovich and I reflected on the fact that she has, in fact, become my de facto husband. I had asked Dave for three solid weeks to fill my windshield washer fluid, hoping against all hope that the warning light would drive him crazy, too. Not so much. Marovich couldn’t bear it any longer. So, she did it for me. She was astounded that it needed more than 1 container of washer fluid, deeming it some technical mechanics term – something like “bone dry.” Marovich will probably be climbing on a two-story ladder (she actually owns one) to change my foyer lightbulbs for me as well. She’s brave like that. After all, she installed her own sump pump this past weekend, which impressed me no end. She insists I could have done it, too, but I’m way too ADD to sit through any DIY YouTube video on sump pumps unless Peter Dinklage is the on-camera talent. 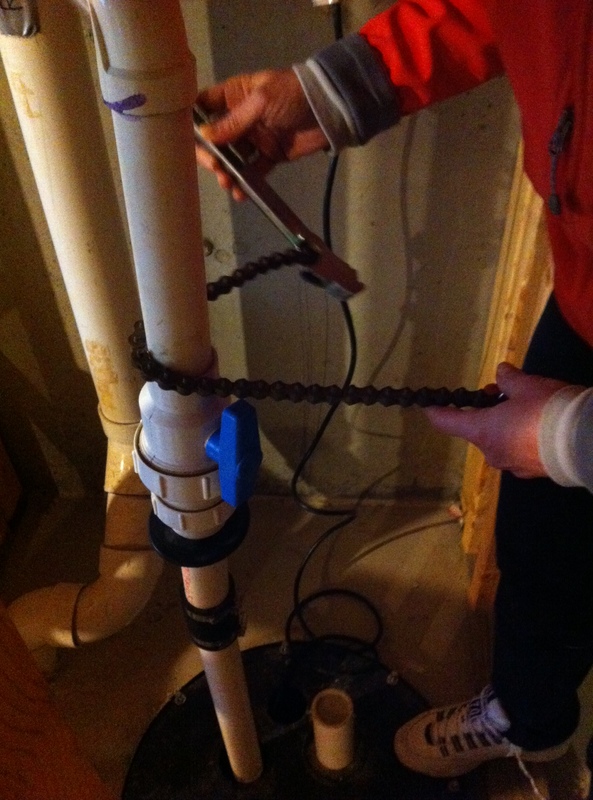 Marovich and her sump pump, and some weird tool that looks like a bicycle chain. Most weekends, when people with husbands/partners get that “honey do” list tackled, Dave’s usually out of town for comic book conventions. 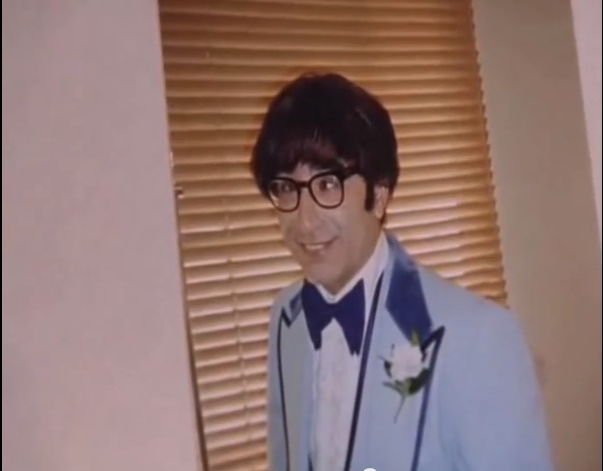 I’m not complaining–I love having the house to myself–and even if Dave were in town, it wouldn’t matter. It makes no difference to Dave if it’s a weekday or a weekend. Every day is the same. He’s still working, napping, and online gaming, so no honey do lists will ever be tackled. No vacations will ever be taken (that aren’t somehow connected to a working trip). Jack will never learn camping or fishing from Dave. None of my hilarious family gatherings will ever be attended (by Dave). As will happen after 15 years of togetherness, aside from a few hours a week of shared TV watching, and the occasional exchange over work-related issues, we lead very decidedly separate lives. And so it occurred to me, after talking with Marovich, that if something ever happened to me, the next spouse should have a field guide for how to manage Dave. And by “manage,” I guess I really mean “co-exist with,” because there’s truly no managing involved. The one thing I’ve learned since meeting Dave in 1999 is, you simply can’t manage an immovable mountain. So here are some helpful tips. #1. This will be your foyer for at least five days after Dave returns from a show. We’re on Day #3 of the foyer looking like this, post SC Con. No, you’re not allowed to actually move this stuff out of the way. 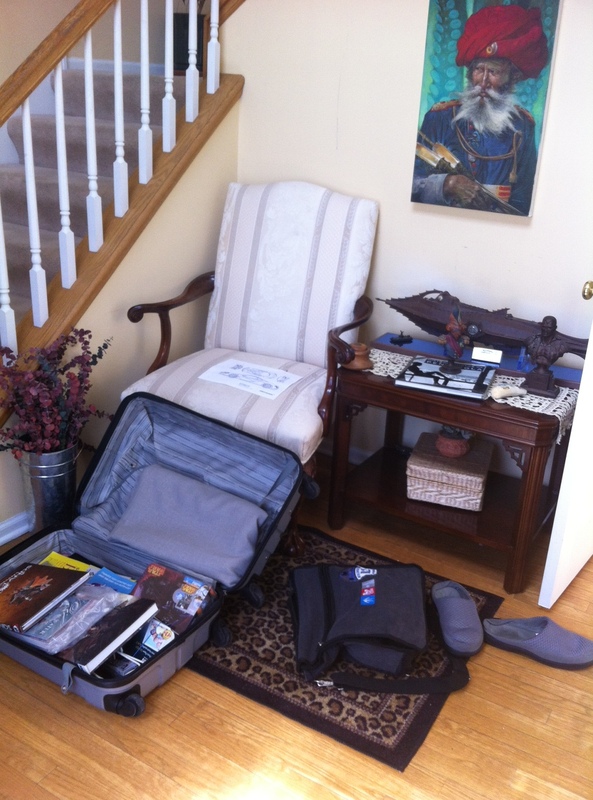 Dave has a very specific way he wishes to unpack the suitcase, so you must not touch it. Or move it. Just learn to accept it’s part of the landscape. Trust me, after a while, you won’t even see it anymore. #2. Your vehicles will never be parked in your garage. (Mind you, this wasn’t so bad in Florida, but if you, too, will be living in Chicago where snow and ice are a factor, this may drive you crazy.) Despite two industrial-sized dumpsters in the last 12 months, our garage is absolutely filled to overflowing with floor-to-ceiling empty cardboard boxes. I’m too embarrassed to even share an image of it. #3. 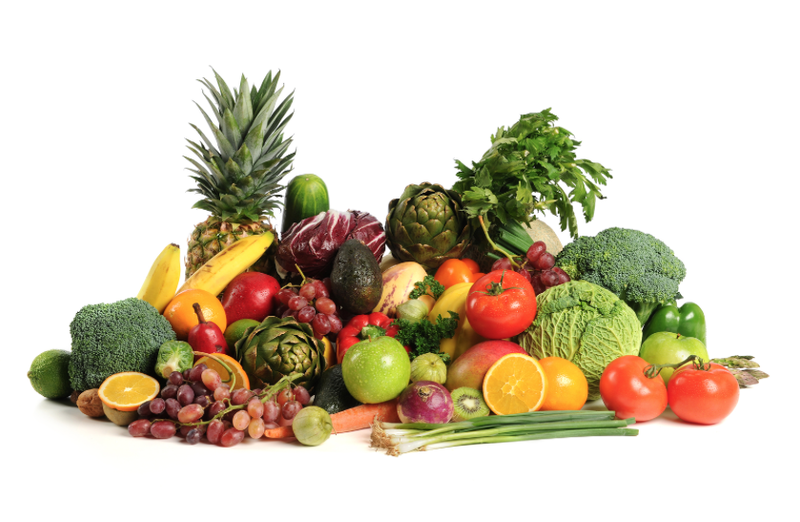 If you love fruit, nuts, and vegetables, you’re eating on your own. (I marvel at the fact that despite growing up in Hawaii, Dave never developed a taste for pineapple. 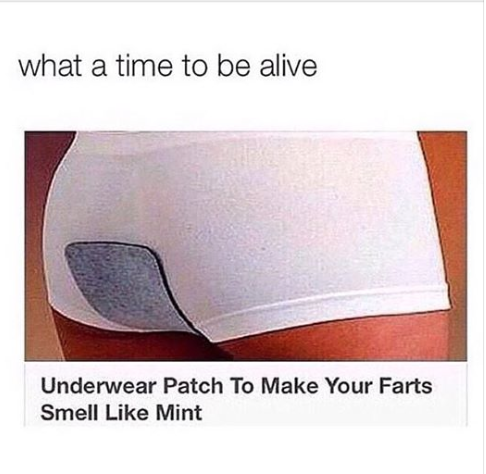 I mean seriously, WTF?!?). Oh, and don’t even think about cooking cabbage in the house you share with Dave. We always pray he’s traveling on St. Patrick’s Day. The foods you’ll be eating all on your own. #4. Burning candles are a no-no. Dave’s heightened olfactory nerves cannot bear the scent of a match or a candle being burned out. Birthdays are really fun around here! The rest of this lengthy list will reside with Marovich and The Sister Wives for safe keeping. Just ping them on this blog in the event of my demise and share your email. They will get back to you. Be sure your printer ink cartridges are new, and you have plenty of paper loaded. In fact, better yet, forward it to Fed Ex Kinko’s so you can get the list printed and bound. So Marovich and I were discussing muscle groups and various workouts when I made the mistake of telling her–of all people–that I inadvertently showed up for a pole class at my dance studio last week. It seems the term “Vertical Fitness” is my studio’s synonym for “Pole Class.” Who knew? As I was attempting to quickly recover and gloss over that part of the story to explain which of my muscle groups needed a turbo-charge, Marovich held up her right hand in that “Stop” position, interrupting. “Wait! 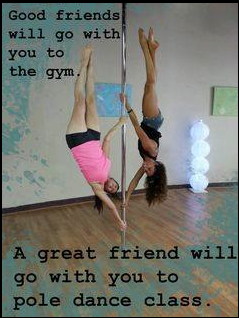 You’ve waited until NOW to tell ME you went to a POLE class? The fact that the owner didn’t even charge me for taking the class should’ve been some indication of my level of participation. 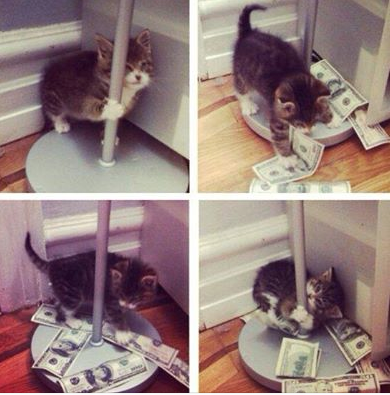 Just because…this looks like Marovich’s new kitten, and it sorta kinda ties in with today’s blog. Whenever I need that humility check, I can always count on Marovich. That’s what BFFs are for.